This demo surveillance video illustrates the 10x zoom capability of the HD-BX50 HD CCTV camera. This video demonstrates the HD-BX50 which is a 10x zoom box-style security camera with 1080p / 2 megapixel resolution. The HD-BX50 supports up the coax zoom functions which means that the zoom commands are transmitted from the DVR to the camera over the same coax cable as the video signal. This diagram shows how this camera is wired at CCTV Camera Pros warehouse. RG59 Siamese coax cable runs the video and data signal to our iDVR-PRO DVR and the 18/2 power cable is connected to a power supply box. This is the live camera view on the DVR. The zoom level of the camera is controlled using the PTZ control screen on the DVR. The letters on the side of this FEDEX truck are 62 feet away from where the camera is mounted. When the camera’s lens is zoomed in all the way, you can clearly ready this lettering on the side of the truck. The HD-BX50 supports 1080p video resolution in three different video modes: AHD, HD-TVI, and HDCVI. This allows this security camera to be used with almost any HD over coax type surveillance DVR that supports up the coax controls. When the lens is zoomed in or out, it takes a few seconds for the camera to auto-adjust it’s focus. We have thoroughly tested the AHD and HD-TVI video models with the iDVR-PROs that we supply. I am going to hide the PTZ controls now so that you can see full screen 1080p video with the camera lens zoomed all the way in. 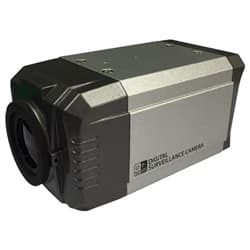 For more information and current pricing, please visit www.cctvcamerapros.com/BX50. Click here to learn more about the HD-BX50 Zoom Box Security Camera used in this video.